On 21st February, the clouds unveiled a deep blue sky and let the temperature rise above 0 degrees – after almost a month. The sun shone brightly, melting snow away. The air felt warm for once. I went to explore Medway Creek again, which always amuses me and I like being in that little habitat by the bridge at the little creek, amidst trees and snow. This fairytale lookalike fragmented woodland is so small, I thought I had explored most of its winter avatar, but I was wrong. On this warm winter day, I decided to leave behind all the worries and deadlines, and wandered into the wilderness for two hours of exploring – where I stumbled upon more than what the previous two walks at Medway Creek had to offer. First thing to strike me was the complete transformation of the lush green woodland into a winter wonderland – merry as ever. The trees were only sleeping and were about to wake up in a month. The birds were chirping and dancing in the sun. Some insects were surprisingly very active. It was more than I expected on a winter walk. I realized that life as we know does not stop in winter. It’s only slow. It seeks us to find it. It does not have to show itself to be seen. It’s there, eagerly waiting for spring. It’s the birds who can’t stop singing about spring or the insects that are already showing up on snow. 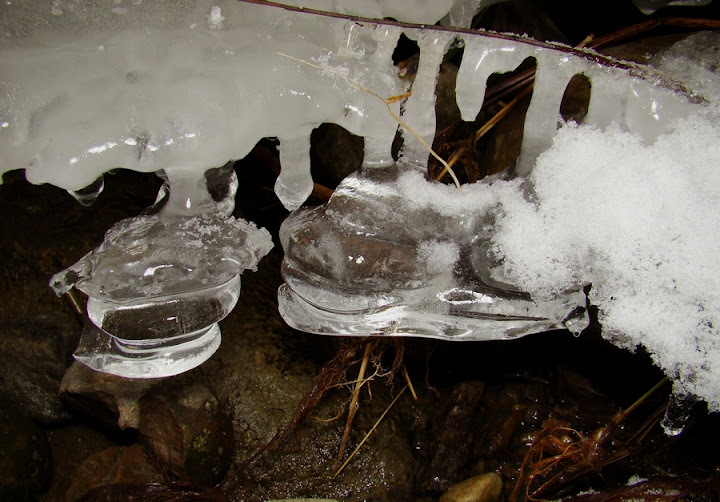 The water itself, flowing underneath slabs of ice sang of life in winter, of life that will be in spring and of how lucky I am to live by this little Carolinian life zone! As beautiful as the Medway Creek is, it is also unfortunately much polluted. According to the UTRCA watershed report card, it is graded D for Forest Cover and a C for Surface Water Quality. Besides the poor grades for biological and chemical parameters, it is also one of the most prone habitats to exotic and invasive species. However, there are good indicators of how healthy Medway Creek is. The trail began as soon as I got off the road. Although the snow was melting, and I knew spring is yet far, I did look for some fresh green leaves and buds, but there was nothing except little Maple buds. The sunlight and snow created a tranquil ambience. With the sun at an angle over the creek, it was a perfect day to practice some photography skills. That’s when I made this image of the dried, back-lit flowers. These dried, crumbling plants are a great subject for photography in different settings. It is not just a dry plant; it is life waiting to rise again. It is a microhabitat for many creatures like insects and spiders. I had photographed dried plants on previous walk and I photographed a few more this time that caught my attention, such as this tiny plant (or a broken stem) buried in snow. It is not completely buried, and seems to lie in a perfect circle in the snow. I once read t a post by the MARVELOUS in Nature, discussing why the snow around trees melts. I did some research online, and came across no absolute reason to why this happens. Some suggested it is because of the heat in the plants; after all they are living organisms. I however agreed on one that suggests that the trees, being darker, absorb sunlight and thus heat up a little – higher compared to the ambient temperature, thus leading to the snowmelt along the circumference of the tree. As I stepped on the snow, I saw hundreds of little insects everywhere – on the bridge, on the trees and on the ground. These were Stoneflies, the very early insects to come out of water during late winter. The Stoneflies are in the order Plecoptera. These are one of the aquatic insects, spending most of their lives underwater. There are about 1700 described species, and more are constantly discovered. These were by far most abundant organisms skittering around that day. I did not come across any nymph exoskeletons, so I assumed they were out for several days now. Some of the Stoneflies were documented mating, which is enough to conclude that their life on land is not that long. As soon as they metamorphose, they mate, and the females lay the eggs – completing the lifecycle. The nymphs feed on aquatic plants, where as adults are known to feed on blue-green algae. The ones I saw belong to family Capniidae, commonly called Small Winter Stoneflies. Males have rudimentary or no wings thus are easy to differentiate from the females which have long wings – covering the tip of the abdomen; but this is not always the case with Stoneflies. Stoneflies are known to be excellent food for fish, therefore seeing so many at Medway Creek was a good sign that there is food in the water. They are also, most importantly, indicators of the health of the ecosystem, thus such numbers hint that Medway Creek has healthy water! So, Stoneflies are the indicators of good oxygen rich waters. On land, however, we have a little concern. One of these is from one insect I least expected to see – a caterpillar called Snow (or winter) Cutworm. When I first looked at this familiar creature, I was startled. I assumed it to be dead, mummified by the cold. I took a few photographs and left it in peace. While leaving the place, I decided to visit this caterpillar again – and was amazed to see this caterpillar vanished. I had seen a Chickadee feeding in that area earlier, so I thought it might have been consumed, but after looking around a bit – I saw it three feet from the spot it was resting on. It was alive and crawling on snow! Cutworm is the caterpillar of some Noctuid moths. They are so called because they feed at the base of the plants, besides leaves and leaf buds. Snow Cutworms are tolerant to cold temperatures, thus it is not surprising to find them during winter months. They are considered as serious pests, and are one of the threats to the native flora of Thames River watershed. Snow Cutworm is the caterpillar of Large Yellow Underwing moth – Noctua pronuba. It is native to Europe; in 1979 it was first found in Nova Scotia and has thence spread over Ontario. The caterpillar feeds on a range of plants such as beets, cabbage, carrot, grape, grasses, lettuce, potato, strawberry, tomato and various other crops (Diagnostic Services, 2006). There’s another animal I came across, which was probably hibernating. 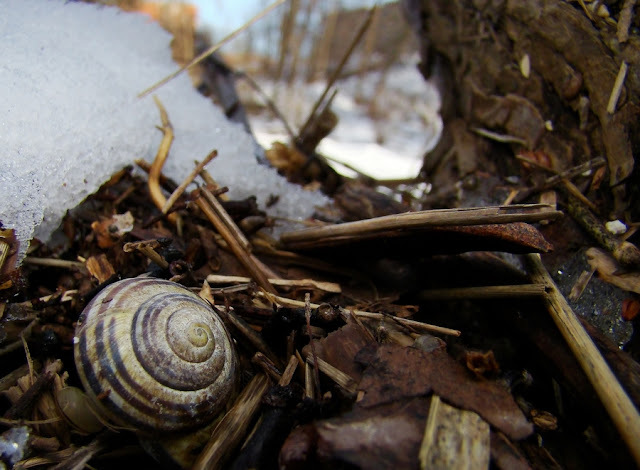 It was a mollusk – a snail. It was Cepaea nemoralis, commonly called a Brown-lipped Snail or Banded Wood snail. It has various morphs, from this striped one seen in the picture, to plain yellow shells. These shell patterns have a genetic basis (Cook, 2008). It is native to Europe, and was first found in North America in 1857 in New Jersey. It has been a common sight in southern Ontario, and is abundant in gardens as well as wild habitats. I did not come across any literature on direct threats from C. nemoralis, but it can be competitive with other native snails and be a pest on threatened flora. One of the most interesting find, one I was very curious to see during winter months was an arachnid – a spider. I was mainly looking on the forest floor and snow for itsy bitsy spiders, but when I was photographing the plants, I saw something dangle down and crawl back up a dry stick. Spider! I said to myself, and was glad to have seen one on that day. It was a very tiny spider. I saw one by sheer luck, but thence I saw many, many more on little dry plants – this, is what I meant by a microhabitat. These dried plants are shelters for many tiny creatures – spiders, aphids, larva of hymenopterans and so on. I saw the spider near dusk, hence photographing it was a real challenge. Photographing this fellow took most of my time, but it was worth it. They were so well camouflaged on thin bone-dry sticks that stood surrounding the creek, that had it not moved, I would have never seen one. The light was low, coupled by utterly tiny size of the spider and my point-and-shoot camera. Nothing was ideal to photograph it, and I refrained from arresting it in a little container just for photography purpose. So, this spider is prefixed with “snow”, just like any other creature seen during winter. After some research online, I came across two very interesting articled on snow spiders. The behavior of the spiders and the articled helped me – more or less – to confirm the family of these spiders. They belong to Tetragnathidae, the “long-jawed orb-weavers”. These spiders are also common in India, and I wrote about them in my post on Common Spider Families of Mumbai. This photographed spider is either a Tetragnatha sp. or a Pachygnatha sp. – both of these genuses are known to survive in winter. Both are known to occur along water bodies, in moist deciduous forests, in tall grass and meadows (The Neartic Spider Database). A life of a spider in winter is very hard to imagine. They are tiny, soft-bodied unlike insects, ecothermic (cold-blooded, like all arthropods) and need to hunt often to live. But everything has a solution in nature. According to Aitchison (1984a), the winter spiders are known to feed on springtails and dipterans in winter. Spiders living below 5 deg C show less feeding due to lower metabolic rate – the spiders hence feed on assimilated food. The spiders tend feed infrequently between 2 deg C and -2 deg C.
There are at least 54 species of spiders known to be winter-active (Aitchison, 1984b). Most studies are done on ground-dwelling spiders. There is not enough information on winter-active tetragnathids that live mostly on plants. The food source could be springtails and aphids that winter on plants too, but there is no literature to back this up. After all the looking into the thickets, I was glad to have seen a little woodpecker busy looking for food – the Downy Woodpecker. It was a male that was busy pecking on tree trunks, oblivious to my presence. It managed to come pretty close to me, too. The Downy Woodpecker is the smallest woodpecker of North America. They are restless, often seen jumping from one tree-trunk to another. They feed on gall-insects, and are seen pecking on branches in winter. The above picture is of a male. The above picture is of a female. After a while, the male was joined by its mate – a female Downy Woodpecker, who was also pretty busy pecking on trees and was unaware of my presence. The female can easily be differentiated by the lack of the red strip on the head. These woodpeckers prefer open woodlands, deciduous trees, and brushy or weedy edges. They are a common sight at bird-feeders. The nature walk was refreshing, recharging and a great learning experience. Seeing such a biodiversity in winter is something I least expected, but it is rich on this little land by Medway Creek. Aitchison, C. W. (1984a). Low temperature feeding by winter-active spiders. Journal of Arachnology , 12 (3), 297-305. Aitchison, C. W. (1984b). 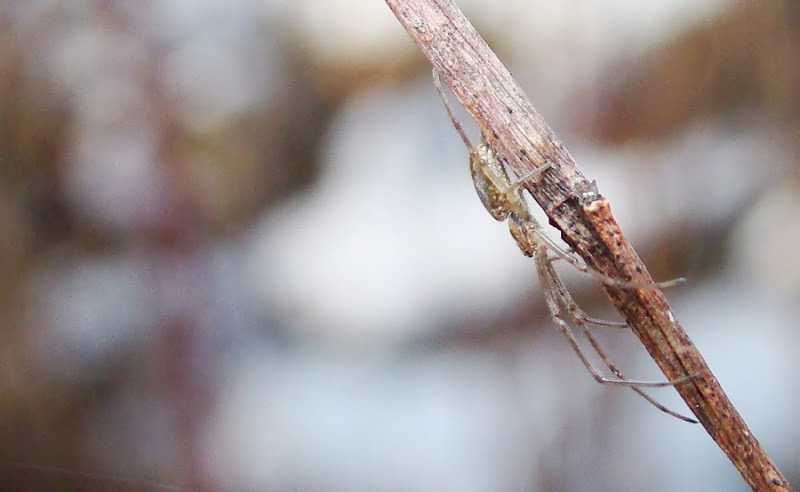 The phenology of winter-active spiders. Journal of Arachnology , 12, 249-271. Cook, L. M. (2008). Variation with habitat in Cepaea nemoralis: The Cain and Shepherd diagram. Journal of Molluscan Studies (74), 239-243.